1. The Airfryer is relatively smaller in size, hence it is perfect for someone who lives alone and has a busy schedule. The Airfryer would work really well for 1-2 people and in the case, you want something which would cook food without too much involvement in the cooking process then this Airfryer is perfect. 2. The Airfryer can reach the maximum temperature of 390 degrees within seconds which makes it pretty easy to use without any preheating like in the case of a convection oven. The Airfryer does use convection fans which are more suitable for giving fried effect to the food items. 3. The basket is nonstick and comes with an internal locking system which keeps the basket firmly locked in while the food is being fried. Using this Airfryer is pretty easy and you can easily clean the basket as it has a non-stick film coating which makes it really easy to clean and reuse again. 4. The separator is where all the excess oil gets collected hence make sure that you are not using too much oil while cooking in the frying basket as in that case the separator is going to accumulate more oil and you have to clean the separator after cooking else the oil accumulation can create white smokes inside the Airfryer. 5. The timer on the AirFryer can vary from 0-30 minutes and once the timer goes off, the Airfryer automatically stops cooking. The handle which is used to pull out the separator is insulated pretty well, hence you can pull out food items immediately after they have been cooked inside the Airfryer. 6. As per the claims, the Air Fryer does get hot inside really fast which implies that you barely need to preheat it before cooking anything(although you might want to do it for a few dishes). There are vents in the AirFryer that help maintain balance in temperature and make sure that it does not get way too hot. 7. This Airfryer comes with a 90-day warranty from the manufacturer. 1. 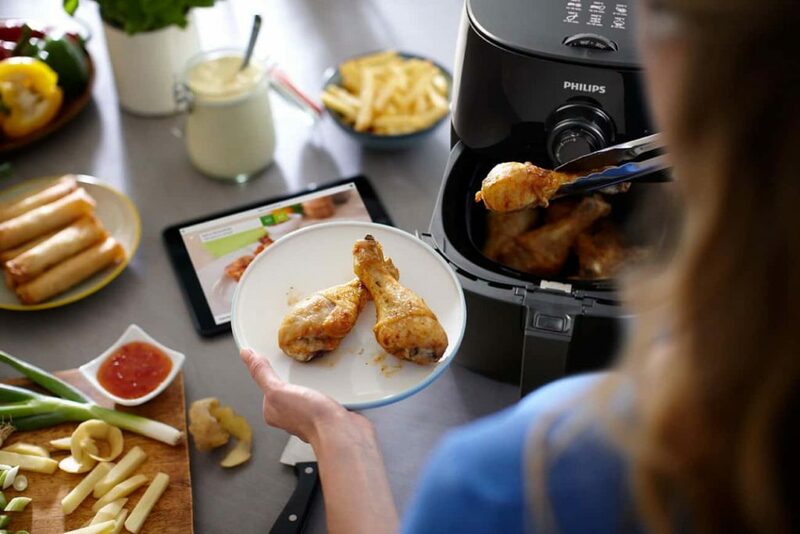 The Airfryer can cook for 1-2 people at a time. If you plan on cooking for 3-4 or more people then you might have to do it in batches. 3. It may not cook every dish with perfection. However, when it comes to the fry settings, it does that job perfectly. You might not be able to bake something with perfection and you might need to get to know the settings a bit better to do that! 4. It produces quite a bit of heat if you use it for more than 30 minutes. 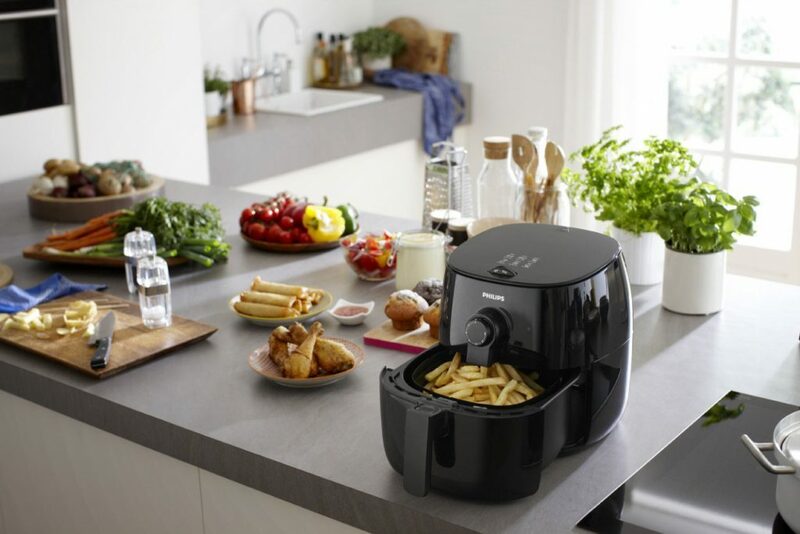 Although there are vents in the Airfryer, you might feel the heat in case you have a small kitchen counter. 2. Set the temperature to 390 degrees as mentioned in the manual and the time to 30 minutes. 4. After 30 minutes the fries turned out to be crisp and perfectly cooked. Although you do not get that deep fried taste, regardless the fries turned out to be really good and tasted amazing. Cooking Chicken Wings on this AirFryer was pretty easy as well. All you had to do is marinate the chicken wings and place them in the Frying basket. 1. Set the temperature to 350 degrees and set the timer for 25 minutes. 2. The chicken doesn’t need to be turned halfway through like the fries and hence you can set the temperature and timer and leave it to cook. 3. Once the cooking is done, take out the wings and you will see that the skin is crispy and the insides of the chicken are juicy. 4. The Airfryer is perfect for cooking the Chicken Wings and if you want to get a more even cooking result you can turn the wings halfway through cooking to get a more even result. Well, to sum up, the Airfryer does pretty well when it comes to all the features and you can pretty much cook anything with the help of the accessories. 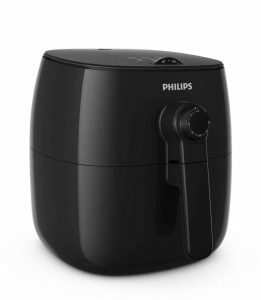 If you are looking for an Airfryer that comes with the maximum features and does most of your cooking tasks with ease then the Philips Airfryer is definitely one of the best out there. The reviews on Amazon for this AirFryer is pretty amazing and in the case you are interested in the product then do check it out on Amazon and let us know what you think in the comments down below.